With my mojo firmly in place, I’ve recently finished another celebration cake, but this time I’ve incorporated a new-to-me technique that I think has the wow factor – brush embroidery. 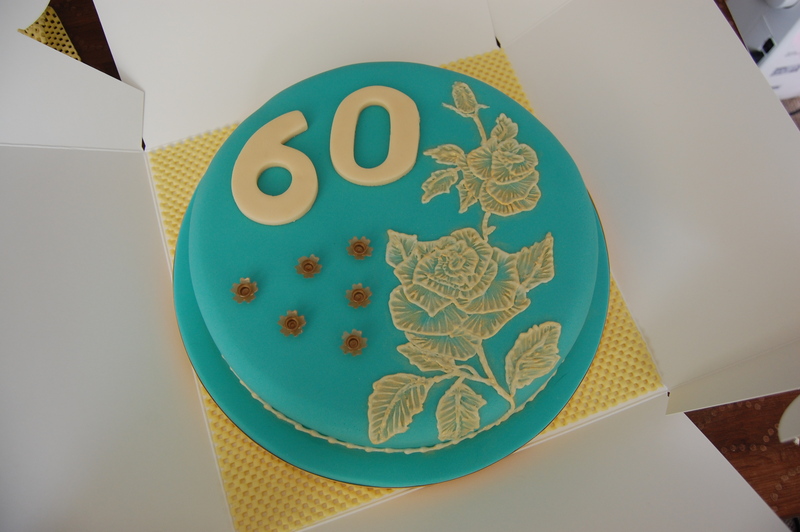 The sky’s the limit with this style of decoration – if you can design it, you can recreate it on a cake. 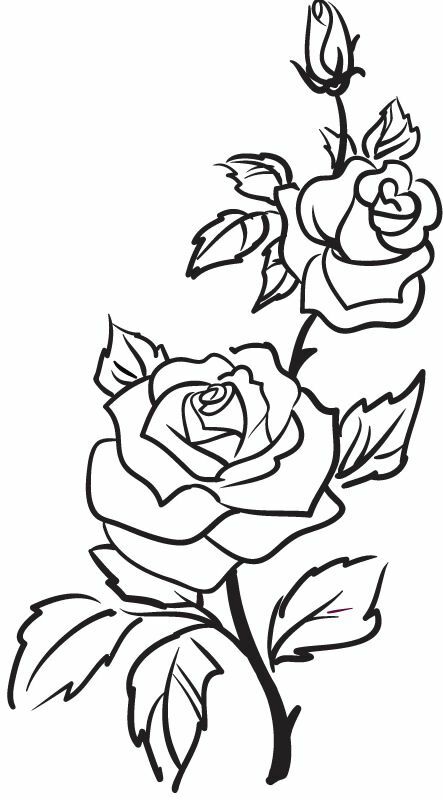 Sticking with roses, I found a design online that I liked (Google things like ‘rose outline’ or ‘flower outline’…’anything outline’ will likely turn up a traceable image of whatever your chosen subject is), then I cut and pasted it into Powerpoint (any photo editing software will do) so I could resize it. My cake is a 10″ light fruit cake and I planned for the design to run off the side, so my template is 25cm long (bigger than the area on top of the cake). 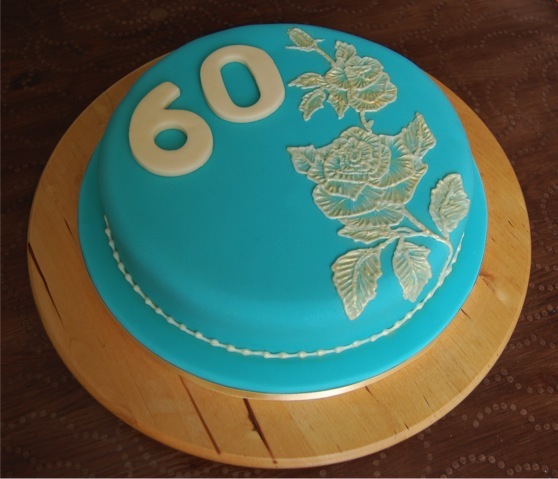 To transfer the image, I used the pin prick technique – I printed the image on tracing paper, placed it on top of the cake and used four dressmaking pins with colourful heads (so I could be sure they were all removed from the cake at the end – nobody wants unexpected added crunch!!!) to hold it in place. 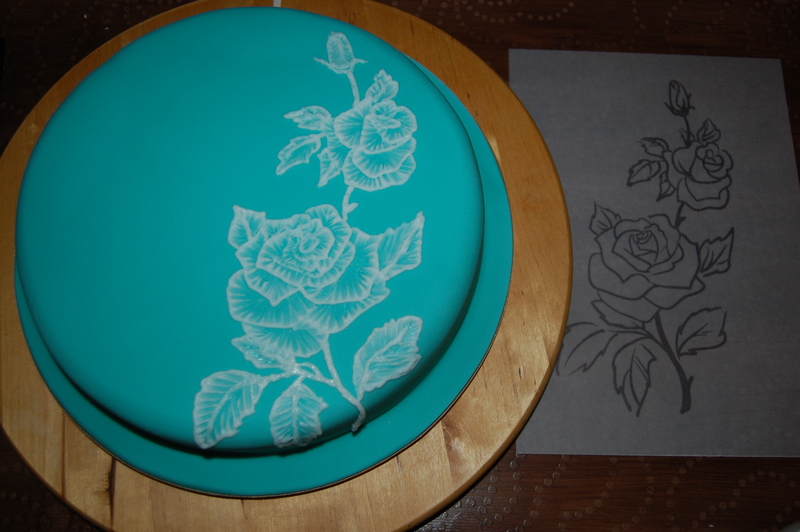 Next, I traced around the design with a pin, lightly marking the sugarpaste underneath. 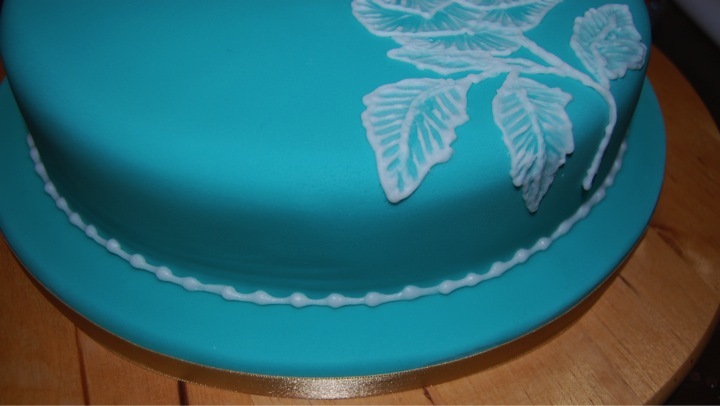 If I were to do it again, I’d follow advice from Sweet Eats Cakes, who suggest pricking your design onto acetate first, and then pressing this into soft sugarpaste. That way, you won’t put holes in your sugarpaste, which are harder to cover up than an imprint. My cake was iced a few days before decorating, so the sugarpaste wasn’t soft enough to try this. All of these tiny pin prick holes make up the rose pattern on the cake. Here, I’ve just started on the brush embroidery. I’ve seen that lots of people use royal icing to do brush embroidery, so I did do a bit of a test run with this, but also watered down white sugarpaste, which I had a hunch might work better. 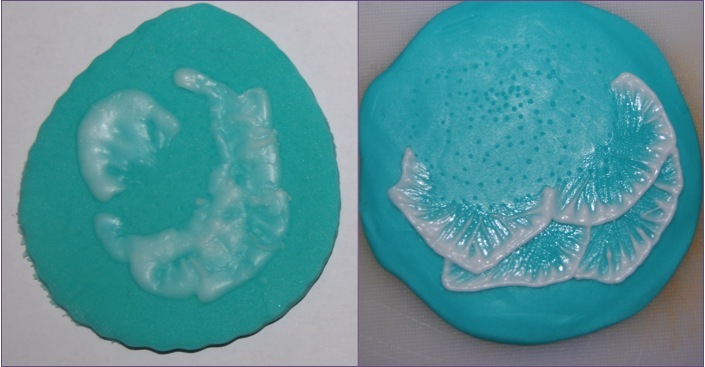 I MUCH prefer working with the sugarpaste for this technique – I found it way more forgiving. Its slightly gloopy nature really lends itself to being pushed around on top of the cake. With a number 2 piping tube, I piped around the edge of each petal/leaf, one by one. For big petals, you might need to run a second line of icing just inside the first to make sure there’s enough icing to pull down. 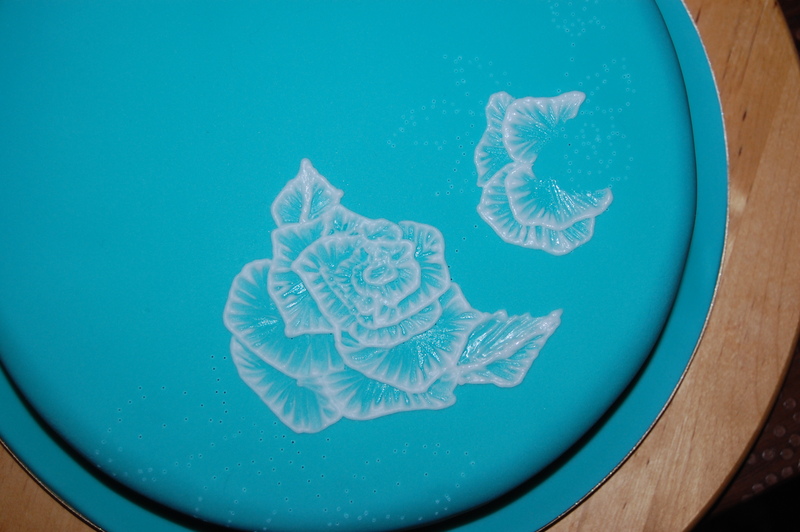 Then, with a small flat paint brush I pulled the icing down towards the bottom of each petal. That’s about it! There’s no special knack – simple technique, big impact. Love it! The next step was to add some beading around the base of the cake. For this, I switched to a number 4 round piping tube. After leaving it overnight, the icing had completely dried and I brushed on some Sugarflair Edible Lustre Dust in Radiant Gold with a dry brush. In case you’re wondering that rather fab jade green coloured fondant is by Renshaw. The gold tint to the numbers is not as vibrant as I would like, but I think perhaps that intensity of colour can only be achieved by painting the sugarpaste. I just kneaded a bit of the gold lustre dust into some white sugarpaste to take the edge off the stark white colour and I’m happy enough with the effect. The only thing left to do was to add some candle holders and box it to take it to the restaurant, where we were celebrating my Mother-In-Law’s birthday with a slap up meal. I think brush embroidery might become one of my ‘go to’ techniques – it’s very effective, relatively fool proof and a massive time saver, compared to modelling sugar flowers anyway. 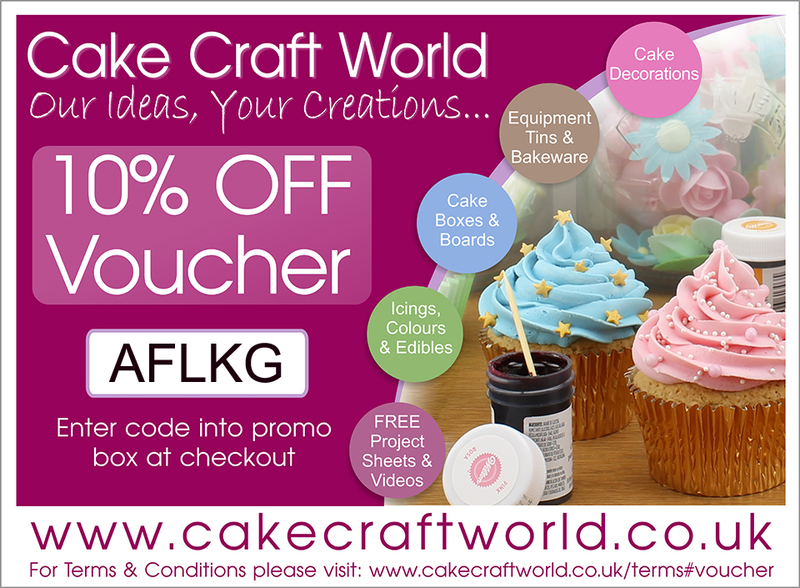 What cake decorating techniques do you find yourselves re-visiting time and again? Do you have a top three?